Austin SEO Geeks will use top quality online marketing techniques to help your business increase views. Austin SEO Geeks web designs provide optimal viewing and interaction experience. We make you look good on all devices. Maximize your presence and speak to your customers that resonate with your brand. Watch sales increase and Austin business take off. We are Austin based SEO Consultants concentrating on search engine optimization and strategic internet promotional efforts. Austin SEO Geeks help companies across the nation efficiently promote themselves online via an integrated strategy of social media strategies, high search engine positions, and lovely web design sites that focus on optimizing conversion rates. Get a Complimentary Website & Promotion Evaluation Sign Up Now! The internet world is an area that is highly competitive. Deciding on the best Search Engine Optimization firm can have an enormous effect on the degree of success your brand sees on-line. 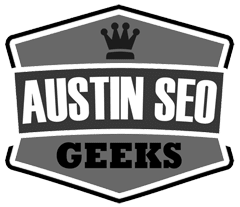 At Austin SEO Geeks, we custom tailor internet advertising strategies for every customer by executing our proven Search Engine Optimization strategies, understanding your targets and getting to know your organization. Austin SEO Geeks is an ROI-centered advertising company, lead management applications to their Search Engine Optimization strategy and we supply our customers the option. Our wide-ranging history in the lead management business has equipped us with a real comprehension of what turns clicks into leads and leads into transactions. Through conversion rate optimized compelling and web design, engaging web copy, our Austin SEO Consultants remain on your website and ensure that visitors locate your site. For Austin companies with physical stores or that provide in-person services, local search is a crucial foundation of an online marketing plan. 24% of all searches have a “local intention”, and for those potential customers to locate your local company, steps must be taken to increase your company’s online presence. When it comes to digital marketing and SEO for your company, it’s essential to look past just your website. For local companies, a powerful online marketing effort also requires attention towards local directories, maps, and review sites. We not only direct optimization efforts towards your website, but we ensure you are not missing opportunities elsewhere. Among the first steps, we take at any job calls for a thorough evaluation of your website, including evaluation of site design, extensive keyword research, competitive intelligence, meta tag and content revisions and much more. Our specialists can custom-design social media stations to coordinate with the feel and look of your website. We can train your staff on networking management strategies that are social or keep them remotely. Using sophisticated research tools, our link building specialists will create a customized link construction software to boost the backlink profile and increase ranks of your site. Austin SEO Geeks is an industry leading Austin SEO team with a proven track record of growing on-line brand presence raising search engine positions and improving ROI reducing overall marketing costs. In today’s fiercely competitive market, you require the complexities involved in establishing an extensive Search Engine Optimization effort that will reach your targeted customer base and experienced at SEO marketing in Austin that understands your advertising objectives. Read more about our company and what makes us tick. Whether you’re a large, medium or small company, Austin SEO Consultants has strategies to satisfy the requirements your company. Listed here are a few of the first and continuing SEO services you will receive when you join with our Austin SEO firm.